Sometimes we feel alone, like we have to make everything happen. Like it's all up to us. But the truth is: The Universe has your back! We only have to ask and the help & support we need is available to us. We can be the recipients of Grace! I love reminders that we have Guardians watching over us, helping to ensure all is well, helping us to create our dreams. Reminders are good, because, well, we all forget, and we all have doubt. 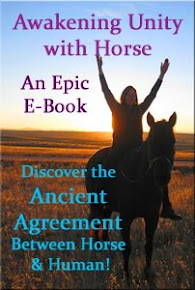 I share one such story of Angelic Intervention to remind YOU that you are Infinitely Supported in All you Are and All you Do with your Herd of Heavenly Horses. I used to be able to drive a truck and horse trailer all over without worry. Then, years ago when I moved across country with a horse in tow, I had one of those near-misses on an isolated, icy stretch of highway in Kansas. The trailer fish-tailed in a snow storm and pushed the truck all over the road. Nothing I did made any difference. I saw my life flash before my eyes, as my truck pivoted 180 degrees to face on-coming traffic, finally coming to a halt. Thankfully, the traffic in that lane, seeing the impending disaster, had come to a stop and we were safe. I'm sure I had some guardian angels back then! But I wasn't aware of such things at the time. Following that incident, I never really felt safe trailering again. I was always nervous. After I learned about energy healing and archangels, every time we loaded up the horses to take them on an outing, I always invoked Archangel Micheal to watch over our trip. Supposedly one of Archangel Micheal's duties is to watch over travels. So I figured, what the heck, it can't hurt. 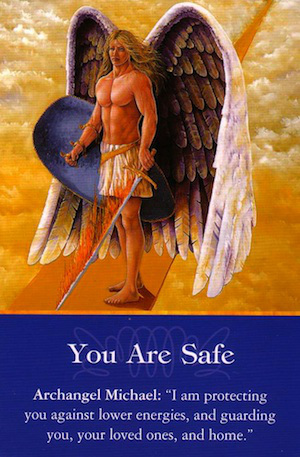 "I ask that Archangel Micheal watch over this trip to ensure our safety and protection. I ask that a golden shield of safety & protection wrap around the whole truck and trailer and that a special shield be placed at the front of the truck, at the back of the trailer, and on the coupling of the truck & trailer. I ask that teams of angels be assigned to all of the tires and the brakes. I also ask that each horse be assigned a team of Safety angels to ensure that each horse stays calm, comfortable, and safe. I ask that each horse be wrapped in golden bubble wrap to ensure their safety. I also ask that a team of angels be sent ahead of our vehicle to ensure a smooth trip, filled with grace and ease." Whew! It's a mouthful and kind of a lot to ask! But I do it faithfully, every time we start down the road, even after we've just stopped for gas. (I even do a similar, but shorter version when I get on a horse to ride). My trip to CA this summer was no different. Admittedly, I was a tad of a nervous wreck, a lot can happen with 2 horses over three days and 1200 miles. So I asked AA Micheal to be along for the ride. Little did I know that the Angels would orchestrate a way to SHOW us just how supported we really are. It occurred on the trip back home from CA. 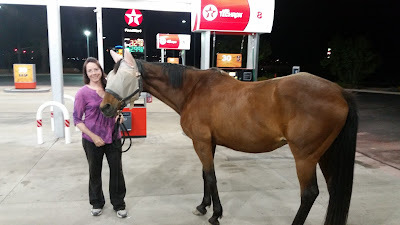 During the first overnight leg, my husband Greg and I stopped at a closed gas station, in the middle of NOWHERE Utah, at 3:30 am. The place was deserted- which was perfect, because we always like to find a safe place to unload 22 yo Seren, so she can stretch her legs during the long hauls. We had purchased an older slant load trainer for this trip since it was easier on old Miss Seren and the trailer had fancy lights! Lights inside the trailer and outside the trailer, which made taking the horses out and reloading in the dark, a little easier. These lights, which were new to us, seemed like pure luxury. And I remember being grateful for them as I walked Seren around the parking lot of the gas station. This particular stop took us longer than usual. More like 45 minutes, with those lights on the whole time, while the truck was not running. Once we loaded Seren back up and were ready to go, I decided to run across the street to use the restroom in the gas station that was open. Greg was supposed to meet me over there with the trailer, but he was still parked when I got out of the bathroom. As I made my way across the street and parking lot, I barely heard him shout, "The truck won't start!" "The battery is dead!." he shouted as I made my way across the deserted parking lot. At just that moment, I sensed the movement of a truck coming out of the shadows to my right. He proceeded to drive slowly right in front of me. With a lack of hesitation uncharacterisitc for me in these types of situations (I usually think things through! ), I jumped forward and flagged the man in the truck down and asked for a jump start. He said, "Sure, I'll try." As he drove his truck over to our truck, I asked Greg if he had some jumper cables to which he replied "No." WHAT THE HECK! Totally unprepared on a cross country trip!?! So I asked the driver if he had some and he said yes. As he hopped out of his truck, I asked him what he did and he said, "I'm a truck mechanic." So with a fancy little machine designed especially to jump trucks, he got our truck started easily in under 2 minutes! Feeling ridiculously grateful, I tried to offer him what little cash we had on hand when he finished, but he refused, saying, "I can't accept any payment, I was right here." So, in no time flat, we were pulling out of the gas station on to the rest of our overlight leg to Grand Junction, with basically, NO INCONVENIENCE at all. I was seriously ecstatic!!! Giggling with glee. 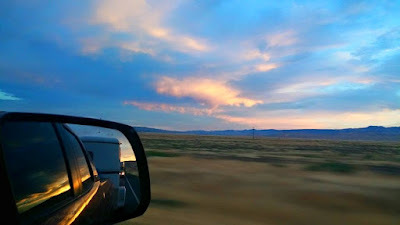 Because as I thought about it, if even one thing, ONE tiny thing, was even slightly off, by even 30 seconds, we likely would have been delayed an hour or more waiting for help in the middle of nowhere Utah in the middle of the night, with anxious and tired horses. If, If, If....if ANYTHING had been even slightly different, we would have missed our ANGEL. But that's how angels work- you are guided to be in just the place at just the right time for the help you need. So I giggled and giggled, feeling GREAT, knowing how much love and support I have. Now of course, my husband the accountant and eternal skeptic said, "Well, if they were really watching out for us, why did they let it happen in the first place? Why didn't they have us turn off the lights?" To which I replied- because THEN we wouldn't realize how supported we are!!!! Sometimes we need PROOF that the Universe has our back. And once we have those little reminders, we can feel GRACE all around us. When I got home, I shared this story with a few close friends and everytime I shared it, both me and my friend would feel the TINGLES. For me, those tingles were further confirmation that indeed, miracles were at work in that instance, increasing my gratitude. So, here's to the GRACE of our Guardians and knowing that by requesting help and support from an Infinite Universe, that we will always be guided to our Greatest Good. A beautiful sunrise after a long night of hauling the trailer. The world is a Magical Place. Call forth your own Magic and let it De-Light you when it shows up! 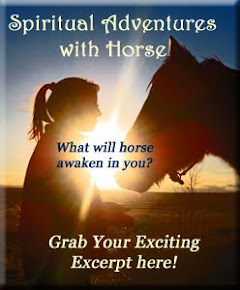 Please share: When have you been witness to Angels, Guides, Grace or Miracles that helped you out around the horses?! How do you like to request assistance from the Universe? Please comment below! This is what makes you delightful, Jenn - recognizing and reporting the Grace. Thank you Pam & Diane! I feel grateful to notice (and at times be the recipient of) the Delight & Grace in the world!!! Pam is correct. You are full of delight, Jenn!! Beautiful syncronistic story of Divine assistance .